First things first – this book has nothing to do with Einstein, for which I ought to dock it several stars for gratuitous use of the great man’s name, but I can’t because it’s such a good book. And it’s about the chemistry of food. The format is simple. 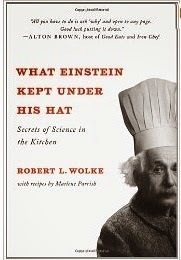 Robert Wolke gives us a series of questions about food that have a chemistry-based answer and… he answers them. Interspersed there are a fair number of recipes, vaguely relevant to the question. And that’s about it. But it’s the way he tells them. That sets the tone nicely. (He goes on to point out it would be useful to know your server’s name if it were socially acceptable to yell it across the room when you wanted service… but it isn’t.) Wolke breaks down the food into various sections (drinks, dairy, vegetables) etc. and just piles on the wonderful (and sometimes silly) questions that enable him to explore the subject. I don’t know if he makes the questions up like most magazines (I don’t really care) – but the format works really well and I genuinely learned a lot about how food and cooking work from the viewpoint of a chemist. A couple of minor moans. It is quite American in feel, with reference to various products Europeans will never have heard of, but it really doesn’t make much difference to the readability and sheer fun of this book. I admit I didn’t read the recipes, but I’m sure they’re nice too. I did notice one oddity. Sometimes (but not always) the recipe calls for ‘kosher salt’. This sounds as bizarre a concept as organic salt. I wish he had a) explained what it was and b) debunked the ‘expensive salts taste better’ myth – and c) pointed out the meaningless of the concept of kosher salt. Overall, though, a real find. Great summer reading – it’s very light to read – but some genuinely interesting scientific concepts put across well.